During World War I, the works of Shakespeare and Austen reached American troops on active duty through the American Library Association’s “War Service Library” program. Between 1917 and 1920, the program collected donations of used books to help them distribute reading materials to the military, ultimately amounting to over 100 million books and magazines to hospitals and encampments. 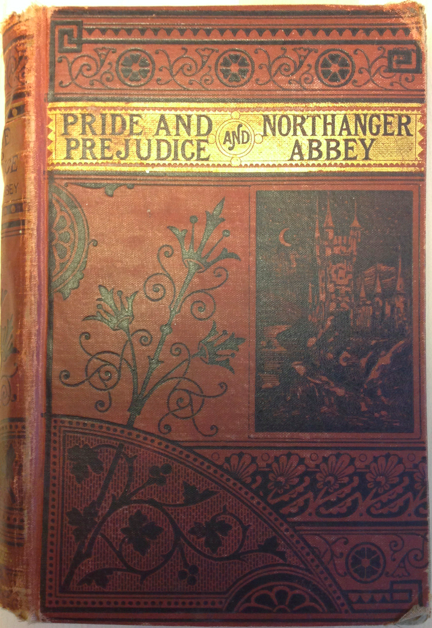 This battered edition of Pride and Prejudice with Northanger Abbey, printed in the 1880s in Philadelphia as one rather hefty volume, is an example of such wartime reading. Remarkably, it survives in its original publisher’s binding by Porter & Coates. Similarly, this particular 1892 copy of the Complete Works of Shakespeare was part of the same wartime book drive. Pasted inside both of these rare survivors are the WWI camp library bookplates that served as their passports to the front. Austen and Shakespeare were deemed wholesome and entertaining reading—fitting reminders of the European traditions that the American military had joined the Allies to protect. For a Brit like Rudyard Kipling, reading Jane in the trenches of WWI was something of a cruel joke—as well as a universal truth. His powerful short story “The Janeites” popularized this term to designate Austen devotees. The story describes a “mess-waiter” bonding with his fellow soldiers over just such camp library copies of Jane Austen. Powerful illustrations by Harvey Dunn accompanied the story when it was originally published in Hearst’s International magazine in 1924. The illustrations assist the story’s gut-wrenchingly juxtaposition of the horrors of war with the intimate talk about “this Jane woman” that is exchanged between officers and overheard by one enlisted soldier. The soldier misinterprets their animated debate as “secret society business,” since it apparently allows different ranks to mix (“It was a password, all right! Then they went at it about Jane—all three, regardless of rank. That made me listen.”). Envying their democratic camaraderie, he pays one of the men “five bob” for instruction and actually reads all six of Austen’s novels at the camp (“what beat me was there was nothin’ to ’em nor in ’em. Nothin’ at all, believe me”). Despite his finding “nothing” in the novels (one wonders what he was looking for), he tries to impress the others by renaming the guns in the artillery unit after Austen’s characters. Amused, his fellow “Janeites” reward him with a gift of cigarettes (“about a hundred fags”). In World War II, heavy shipments of used books for camp libraries gave way to lightweight paperbacks designed to fit in the pocket of a uniform. Will and Jane were in those pockets too. 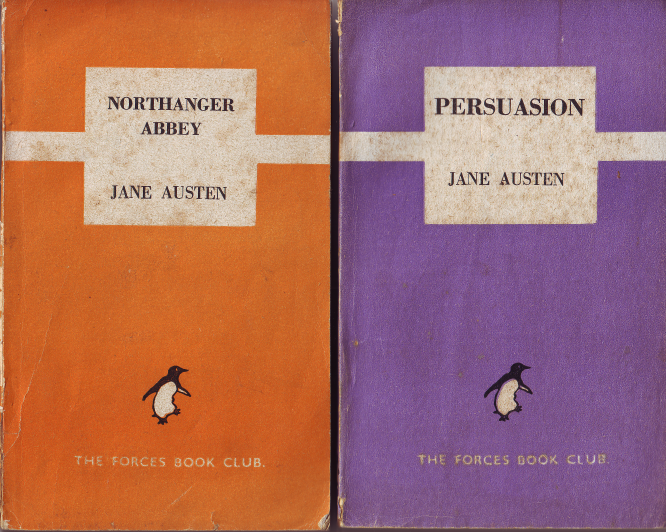 Jane was part of Penguin’s “Forces Book Club” series for British servicemen. Starting in July 1942, a Penguin Books committee selected 10 books a month for a total of 120 titles, printed especially for “remote and inaccessible units.” The series included Northanger Abbey in April 1943 and Persuasion in June of the same year. On the American side, the coveted “Armed Services Editions” grew to 123 million copies of 1,322 titles between 1943 and ’46. Shakespeare made it into the pockets of these American troops only in the form of a critical study by Mark Van Doren, an influential American literary critic, whose book was titled Shakespeare. More recently, however, Henry V was printed as part of the pocket-sized “New Armed Services Editions” for American troops serving in Iraq in 2002. Combine the complex reception histories evidenced by these wartime books with Sir Winston Churchill’s well-known enthusiasm for Jane Austen, and you have to ask yourself: How did this soldiering Jane of the first half of the twentieth century ever become hyped as a girly “chick lit” author at the century’s close? How did Jane’s works, and not Will’s, get gendered female if these authors share a similarly gritty, soldiering history that reflects far more on the shifting tastes of British versus American readers than on differences in the literary tastes of men and women? For the gendering of Austen, we have only to look to to the marketing of her works in the 1950s and 60s. This sampling of covers that “pinked” Austen shows the sudden post-war gendering of her works through graphic design. The result is the relatively recent urban myth that Austen is read only by elegant females. Come see our exhibition Will & Jane, which tracks many other stories in the reception histories of Shakespeare and Austen, before it closes on November 6. NOTE: This post (and the related section in our exhibition) extends ideas first expressed by Barchas in “G. I. Jane: Austen Goes to War” on the JHU Press Blog (23 April 2014). We appreciate Johns Hopkins University Press enthusiastically encouraging us to reuse part of that post here.